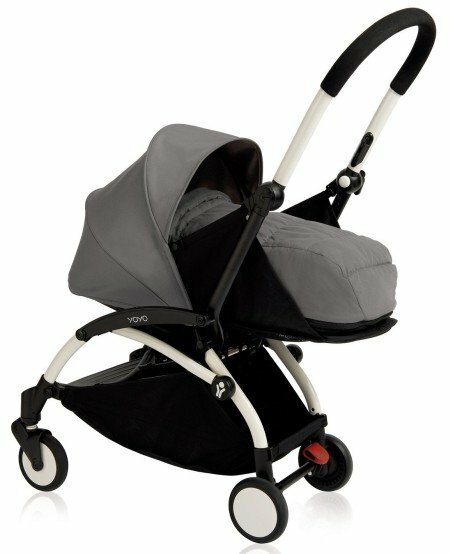 BABYZEN YOYO+ - Best Convertible Lightweight Stroller For Travel? 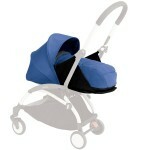 BABYZEN YOYO+ really stands out from other strollers. It’s so lightweight and compact that you can use it for travel by plane with your baby. You can use it not only for a toddler but also for a newborn baby! And on top of that, it has fancy and trendy appearance. BABYZEN proves that convertible stroller doesn’t have to be bulky and heavy. YOYO+ is a modern all-in-one stroller that offers three seating configurations, while it’s ultra-light and compact. Now you can have a lightweight stroller suitable from birth that really grows with the baby. Psst! Do you often travel with your baby and need reliable compact stroller? Check out my full ranking of the best lightweight strollers for 2019. 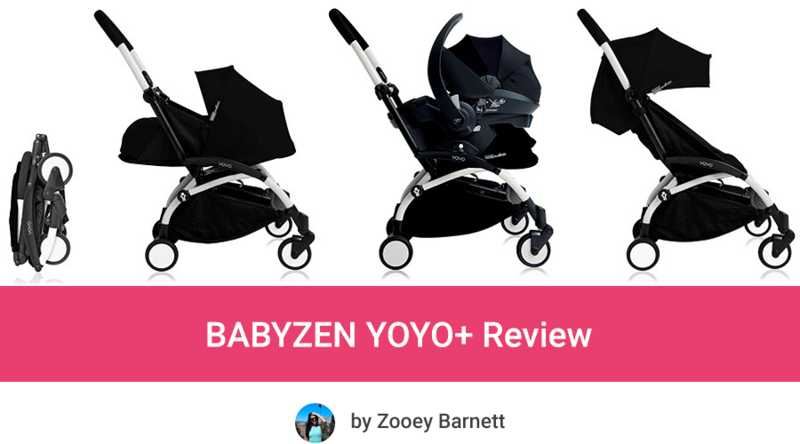 What other parents think about BABYZEN YOYO+? 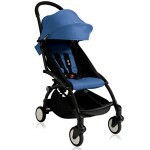 As for such a compact stroller, it is really well equipped and has a lot of features to adjust to modern family needs. BABYZEN YOYO+ is equipped with a regular toddler seat, suitable from 6 months, however this lightweight stroller can be used from birth – if you attach the infant car seat compatible with it or change the standard seat for newborn pack. It’s so cool to have convertible stroller that weighs so little! YOYO+ comes with the 6+ Color Pack which is a basically a toddler seat, suitable from about 6 months (when the baby can sit upright unassisted). Fabrics for the regular seat are available in 9 different color versions which are just beautiful, not shiny or flashy at all! What I really like about these fabrics is that they are fully removable. You can easily clean them – just throw them into the washing machine and voila! You don’t have to worry when the seat gets dirty or something spills out during your stroll. The seat is very easy to keep clean. Moreover the padding is very soft and comfy for the little passenger and his delicate skin. Now let’s take a closer look at the seat functions. Toddler seat is front-facing therefore the baby can watch the World while riding. You cannot reverse the seat. The backrest reclines to 145 degrees and you can lock it at any position. Although it doesn’t go flat, it’s deep and comfy enough for toddlers who like to nap on the go. The seat is equipped with 5-point harness to keep baby securely in place. There is also a footrest where taller and older babies can put their feet on during a stroll. I wish it was adjustable, as it would provide even more comfy and cozy position for legs during naps. Although the padding on the backrest is rather short, BABYZEN YOYO+ can serve you as a stroller for bigger kid or taller toddler because there is a lot of room to grow from the top of the seat to the top of the canopy. Taller baby will fit in this stroller, however he won’t be able to rest his head or only a part of his head will be supported. Nevertheless, the toddler seat is suitable up to 40 lbs. 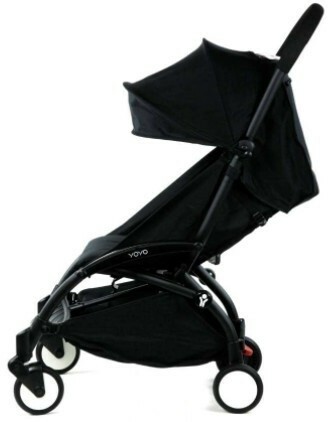 YOYO+ has extendable canopy – it’s not very big or long, but it’s decent for a lightweight travel stroller. It does keep the sun out of baby’s eyes and protects him from harmful rays with UPF 50+ fabric. There is a small plastic peek-a-boo window so you can check on your little one whenever you want. I only wish it was made of mesh fabric to provide extra ventilation. A cover for this window would be also nice touch. 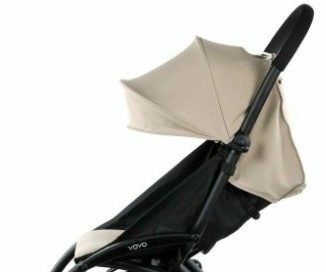 You can fully close the canopy, when you don’t need it or if you want to use YOYO for older and taller baby. 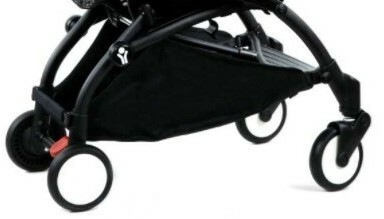 Folded canopy doesn’t cover the handlebar and doesn’t get in your way while you’re pushing the stroller – big plus. You can buy your BABYZEN YOYO+ with newborn fabrics which are suitable from birth. You can also purchase this carrycot separately. To attach the Newborn Pack you need to remove the toddler seat fabrics first and then swap them for newborn fabrics. This carrycot features fully flat position which is the most comfortable and safe position for newborns and infants who don’t have enough neck and head control to sit upright. The carrycot is parent-facing so you can keep an eye on your newborn the whole time. It also has 5-point harness and 3-position pop-up canopy. Infant head support and foot cover create cozy, warm and safe place for little infants. Keep in mind that this carrycot doesn’t stand alone and when you detach it from the frame it will collapse. Therefore it’s not suitable for overnight sleep. You can use it only when it’s attach to the stroller frame. The 0+ Newborn Pack is designed for babies from birth up to 20 lbs and/or 28’’. I love that this lightweight stroller offers a seating option for newborn baby and a toddler, that’s to it you can have a super compact and portable stroller from birth. It’s perfect option for parents who travel by plane or train a lot and they want their newborn baby to accompany them. And the best part is that the stroller folds exactly the same with newborn and toddler fabrics! Traveling with newborns and toddlers has never been so easy. Would you like to use BABYZEN YOYO+ from birth? Check how much costs YOYO+ with Newborn Pack or purchase the carrycot separately here. There is also other option that allows to use BABYZEN YOYO+ from birth, which is very convenient for parents who often drive. 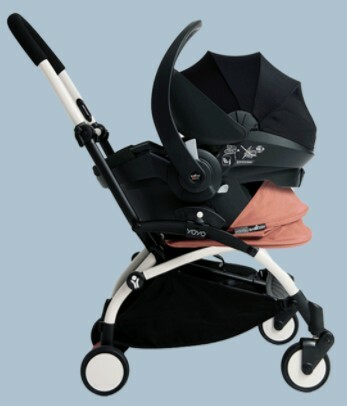 You can attach to the stroller an infant car seat and use BABYZEN YOYO+ as a travel system. YOYO+ is compatible with few infant car seat. You just need a proper adapters (sold separately) to clip the car seat onto the frame. BABYZEN YOYO+ is a small travel stroller, therefore it’s not surprising it has small wheels which are designed mainly for flat terrain. The wheels can handle old sidewalks or cobbled streets but the stroller will jiggle a bit. I wouldn’t take it for an off-road trip for sure and I would recommend using it on bumpy roads only for short-distance strolls. Front wheels are not lockable, but they are equipped with “Soft Drive” system which ensure the wheels adapt to the ground conditions. Despite the small wheels BABYZEN YOYO+ is very maneuverable and nimble. It’s slim and lightweight so it fits just about anywhere. Tight corners, narrow sidewalks or crowded aisles in stores won’t be a challenge for YOYO+. You can even steer it with one hand, while holding a phone, shopping bags or your baby in other hand. YOYO+ is equipped with single-action brake. The pedal is located next to the right rear wheel and it’s rather easy to press and lift, however it could a bit bigger. Not a deal breaker though. BABYZEN YOYO+ has unadjustable handlebar, fixed at about 42 inches from the ground. I checked the customer reviews on Amazon to find out that other parents say about it. It turned out that short and average in height people (for example 5’1″ and 5’8″) find it very comfortable and easy to push. However, it is less convenient for taller parents (about 5’11”) as they slouch over it which causes the back pain. Moreover parents higher than 5’11” sometimes hit the rear axle with their feet, when they push the stroller with two hands. The handlebar has one more, noteworthy feature. 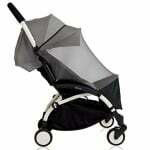 You can drop it down, independently of the stroller (but together with the sunshade), for easier storage at home. This is a lightweight stroller for travel so I didn’t expect a large basket. However, YOYO+ has decent storage space. The basket under the seat can accommodate 11 pounds of your essentials and it’s spacious enough to accommodate medium-sized diaper bag. Not bad for such a compact stroller. The bin is easily accessible from the back, a bit harder from the front, but still manageable. There is also a convenient storage pocket on the back of the canopy with a zip closure. You can easily fit there your phone, wallet, keys and other small valuables. BABYZEN YOYO+ is extremely compact and light. The newborn version 0+ weighs 14.55 lbs, while the toddler version 6+ weighs only 13.67 lbs. You can carry it up and down the stairs or around the town almost effortlessly, when the baby wants to walk. 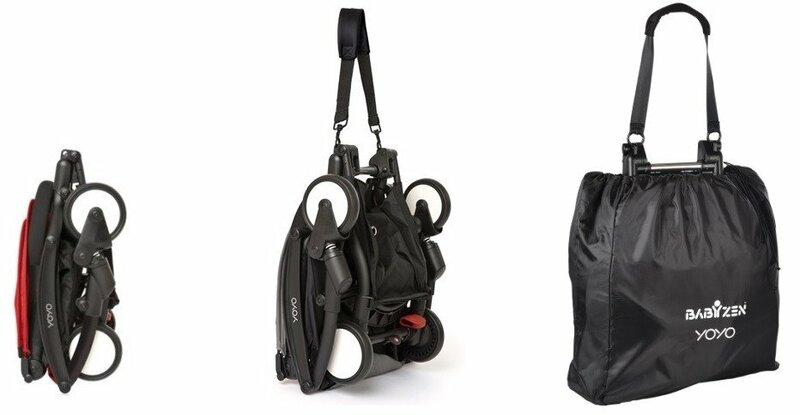 YOYO+ comes with a convenient shoulder strap and chrome handle for easier transportation. When you open the stroller the shoulder strap slips into the storage basket. I saw that many parents carry the stroller on one shoulder, while holding a baby in the other arm. It’s so light and portable. At first I couldn’t believe that YOYO+, light as a feather, can be sooo versatile. Folded BABYZEN YOYO+ is ultra compact and portable. You can take it as carry-on on most of airplanes! But that’s not all. It folds seamlessly into a compact package. And you can fold it using one hand, while holding your baby in other one! BABYZEN YOYO+ folded dimensions are: 20.47″ x 17.32″ x 7.08″. Such a small and compact stroller is a perfect solution for parents who don’t have much free space at home or have small car. The stroller comes with a carry case (it looks like a sac), useful for transportation and storage. You can also purchase separately a travel bag that looks like a purse. The best part is that YOYO+ folds the same way with Newborn Pack! Check it out on the video below. Thanks to so such a compact fold BABYZEN YOYO+ meets carry-on regulations of most of the airlines (to be sure, compare its dimensions with the regulation of the airline you’re flying with). This means you don’t have to check it at the gate, you can take in on board as a cabin luggage and fit it in the overhead compartment. No more waiting for the stroller after landing. No more worrying whether it will break or tear. You can keep your YOYO+ always with you and put your baby in it right after landing. This is a perfect stroller for parents who often travel with their baby by plane or frequently use the public transportation. I always check customer reviews before I decide to buy something, especially if it’s a product for my kids. BABYZEN YOYO+ is very expensive as for a lightweight stroller so I wanted to make sure it is worth the money. Last time I checked it on Amazon, it didn’t have many reviews on Amazon, but most of them very positive. If you are curious what parents who own the BABYZEN YOYO+ think about it you can check the customer reviews on your own. Below you can find the major advantages and few drawbacks that parents mention most often. The biggest asset of BABYZEN YOYO+ is the compact fold which fits in overhead compartment on most airplanes. Parents love the possibility of taking it as carry-on. 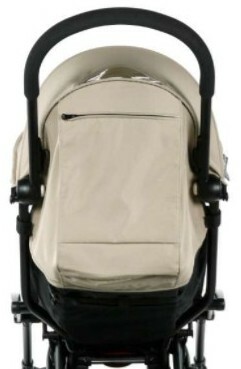 Another advantage is lightweight construction which makes the stroller very easy to carry with a shoulder strap. Many customers recommend YOYO+ for other parents who travel a lot or those who don’t want a complicated stroller. Some parents use it not only for travel, but also for everyday use as it is very practical. It’s perfect for urban area and tight places (like small stores, restaurants etc.). Also good choice for parents who have small house or small car. Few parents emphasize that frame is stiff and strong, despite it’s very small and light. Another advantage is good amount of sun coverage that canopy provides. 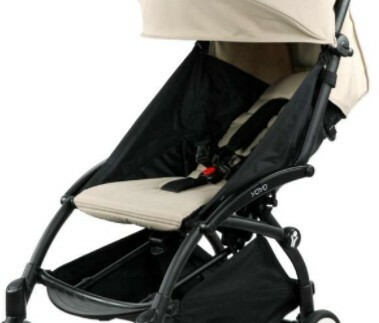 The whole stroller is well-built and made of quality materials. Customers also praise the colors and beautiful look. Folding and unfolding is a breeze and takes few seconds, whether you have the carrycot or toddler seat fabrics attached to the frame. The storage space is decent for such a compact stroller. 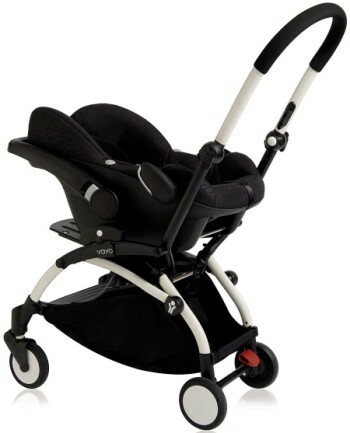 Parents love the possibility of using the YOYO+ from birth with the car seat and carrycot (parents say it’s very cozy). Included rain shield and storage bag are another advantages. The wheels roll smoothly, especially on flat ground. On gravel and harsher terrain this stroller doesn’t work very well, but many parents emphasize that such a light stroller is not designed for it, so it’s not a deal breaker. Many parents praise the BABYZEN YOYO+ for excellent maneuverability, nimbleness and one-hand steering. However one person mention that YOYO+ is difficult for him to push with one hand (I think it depends on the parent height). Reclining mechanism is nothing ingenious. It’s just a strap and buckle, which some parents don’t like. The back of the seat is a bit thin. However, the recline is fairly deep. The handlebar is not height-adjustable. Short and average in height parents (about 5’1” – 5’10”) don’t complain about it, but taller parents say it’s less convenient for them. One parent also complain about the lack of the cover for peek-a-boo window. Another disadvantage is the lack of lock for folded stroller. Moreover, attaching the seat fabrics (for example after washing) is not very easy and convenient. One parent also complained about the harness straps being difficult to adjust. Would you like to read more customer reviews and see YOYO+ rating on Amazon? You can do it here. BABYZEN YOYO+ offers 9 colors for the 6+ Color Pack (fabrics for the toddler seat) and 0+ Newborn Color Pack (fabrics for the newborn carrycot). You can purchase YOYO+ in Peppermint, Blue, Black, Grey, Taupe, Ginger, Pink, Red and Navy Blue (colors of the Air France airline). The colors looks really nice. They are very stylish and trendy, but not flashy. You can be sure you’ll get lots of compliments from other moms. 🙂 Keep in mind that the availability may vary for different colors, make sure to check it here before you decide to buy it. 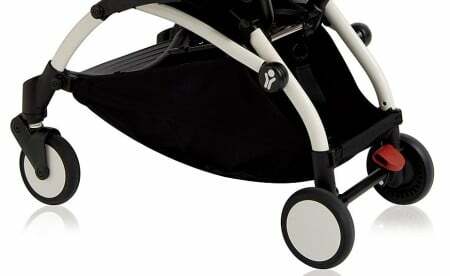 BABYZEN YOYO+ comes with a Carry Case which simplifies transporting and storing the stroller. There is also a rain cover included with the YOYO+. This lightweight stroller is expensive so it’s good that it comes with these two accessories. Of course there are many other convenience items that you can purchase separately. 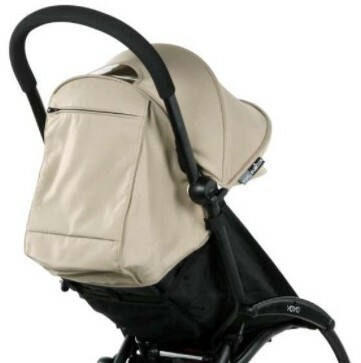 0+ Newborn Color Pack – The carrycot is sold separately or you can buy it with the stroller as a set. It is not a full sized bassinet, but this cocoon provides fully flat position suitable for newborn baby and supports his spine properly. 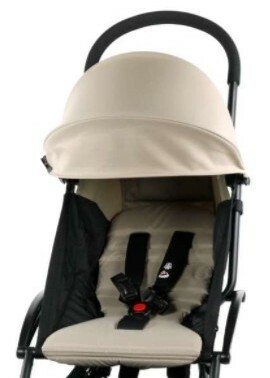 With the foot cover, canopy and head pillow the infant is well protected from sun and wind and can lie comfortably in cozy, safe and sheltered space. It is available in many different colors so you can match it with the toddler seat fabric or choose a different version. Infant Car Seat Adapters – If you want to use BABYZEN YOYO+ as a travel system, you will need special adapters that allow to click the car seat into the stroller frame. Travel Bag – If the included Carry Case doesn’t meet your needs, you can purchase a Travel Bag with shoulder trap for convenient carrying. Footmuff – BABYZEN offers amazing footmuff which will definitely keep your baby warm and cozy during cold winter days. The footmuff has detachable top cover. It comes in 7 color versions. BABYZEN YOYO+ Board – It’s amazing that this lightweight convertible stroller offers a seating option for the second, older kid! You can simply attach the board to your YOYO+. 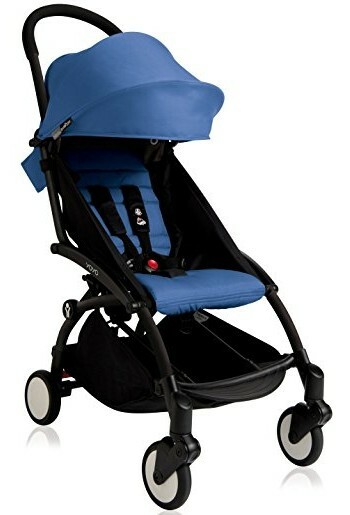 It’s a perfect option for older sibling who sometimes gets tired on longer distances and his little feet need a break. He can stand on a board or sit on a saddle. It can hold a kid up to 44 lbs. When it’s not in use, you can simply fold it and when your child wants to ride again he can easily hop onto it. Parasol – It may be very useful during hot summer days, especially since the canopy is not very long and doesn’t cover baby’s legs. Insect Shield – Very useful accessory, especially if you live or travel to area where there are a lot of flying insects. The mesh cover will protect your child from mosquitos and other insects without blocking the air circulation. 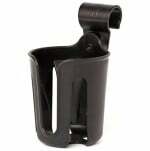 Cup Holder – If you want to keep your water close to you during strolls, this is a must-have. 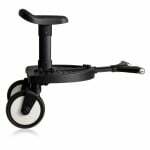 It is light and has very small wheels so it’s not suitable for all types of terrain. Works great on pavement, asphalt, sidewalk, smooth dirt road and for indoor use (at the mall and airport). It will wobble a bit on cobblestone. I wouldn’t recommend it for rough terrain with many bumps, especially if you like long-distances strolls. 1. It’s a space-saver. It won’t take up much space at your home and car trunk (you can even put it behind the driver seat!). 2. It gives parents freedom to go with their baby wherever they want: restaurants, small grocery stores, zoo, crowded museum. 3. It makes traveling with baby so much easier (not only with a toddler, but also with an infant). Folds the same with the carrycot and toddler seat and can be taken as carry-on on most airplanes. Are you thinking about buying BABYZEN YOYO+? It’s an expensive stroller so before you purchase it, make sure it really suits your needs. Check if there are any available discounts and see what other parents wrote about it on Amazon. Hi there! You’re right, the adapters have to be removed each time. You can’t fold Yoyo with car seat adapters on, you need to detach them first. For installation in the car, you have to detach the adapters too.